Many say that Taiwan's ruling KMT party strong-armed a controversial trade deal with China through the legislature, and protestors demand a public review. On Tuesday, some 300 student protestors stormed Taiwan's parliament in Taipei, tearing down its "Legislative Yuan" sign and barricading themselves in. Protests are common on the East Asian island, but takeovers of parliament are unprecedented. 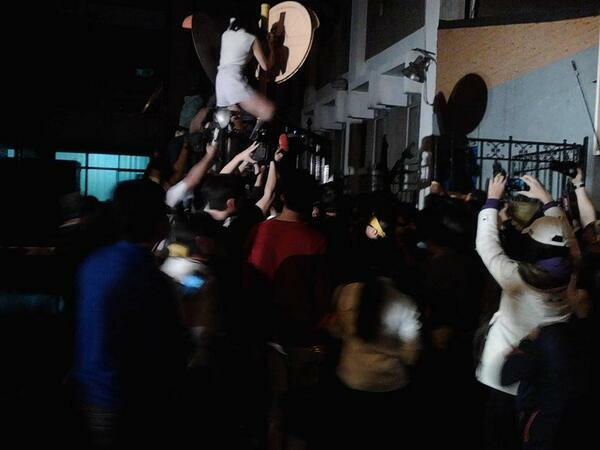 Groups of students have also been blocked by riot police on Qingdao Road near the parliament building. The student group mobilized on Facebook against the ruling KMT party's "illegal hastening" of a trade agreement with China. The trade agreement would allow China to invest in 64 service sectors in Taiwan, including advertising, retail, print, healthcare and telecom. All Chinese businesses with over $200,000 in capital would be able to send workers to Taiwan on renewable visas. The ruling party argues that it benefits Taiwanese conglomerates and, by extension, Taiwan's severely lagging economy. Opponents claim it will allow China to threaten Taiwan's democracy and small businesses by mass immigration and investment, the same way it has for Tibet. Taiwan has a population of 23 million with a per capital income of $21,000*, while China has a population of 1,355 million with a per capita income of $9,800*. Undergirding the protest is also President Mah Ying-jeou's tremendous unpopularity (as of September 2013, his approval rating was 9.2%). Below is a widely shared 2006 video of Mah blasting then-sitting President Chen Shui-bien: "A president with 18% approval has neither the trust nor the respect of the people. The people have the right to impeach him by force," a sentiment that Mah's detractors now share. Since June 2013, President Mah has fielded accusations of deliberately avoiding item-by-item public scrutiny on his trade agreements with China, insisting that they all be passed en bloc. Below is a broadcast from UDN, a network known to lean toward the ruling KMT Party. Meanwhile, the ruling KMT party accuses the Democratic Progressive Party of rallying anti-China sentiments against the trade agreement in an obstructionist ploy. On Monday, the ruling party cut short a bipartisan review of the trade agreement, and in a rushed 30-second statement, announced that it would go directly to finalizing the deal with China. Many saw that as blatant flouting of democratic process. Student protestors now hold signs that say "75% of Taiwan demand an item-by-item review of China deals," promising to occupy the building until March 21. Much of overseas support for the protestors have come from Hong Kong, which returned to China's control in 1997. Many in Taiwan express discontent with mainstream coverage of the event. An alleged Facebook rant by a video editor at CtiTV has been widely shared in social media. Press vans from TVBS Channel were plastered with notes that read "thanks for making fake news for my parents." Popular author/essayist Giddens Ko posted this message to his 1.1 million followers on Facebook. As of March 23, crowds have marched toward and entered the cabinet building — a move that many organizers disagree with since the cabinet building is protected under public protest laws. Local media reports that police has begun to bludgeon unarmed protesters staging a sit-in on Qingdao Road, and 68 have been admitted to hospitals. You can watch an ongoing Livestream from within the building.